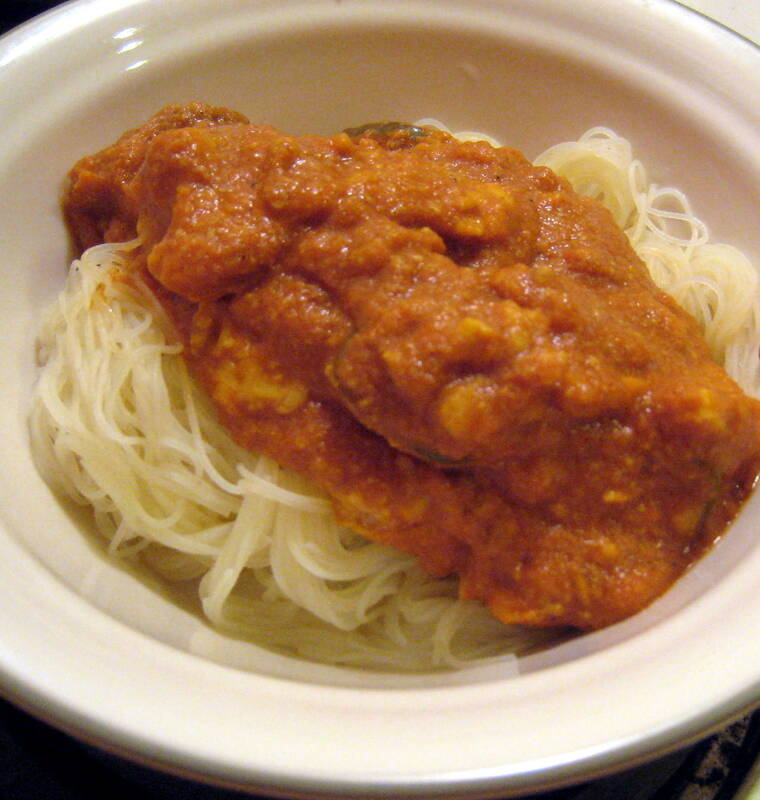 The secret to this recipe is to use a combination of different curry powders. We used S and B, madras curry, and tandoor spices. With an avocado dipping sauce! We modified this recipe from Serious Eats. Preheat oven to 400 F. Line a baking sheet with parchment or foil. Bake tempeh wings for 30-40 minutes until slightly blackened. Spread any leftover marinade on wings and enjoy. Easy! This was actually better than our last Reuben attempt! 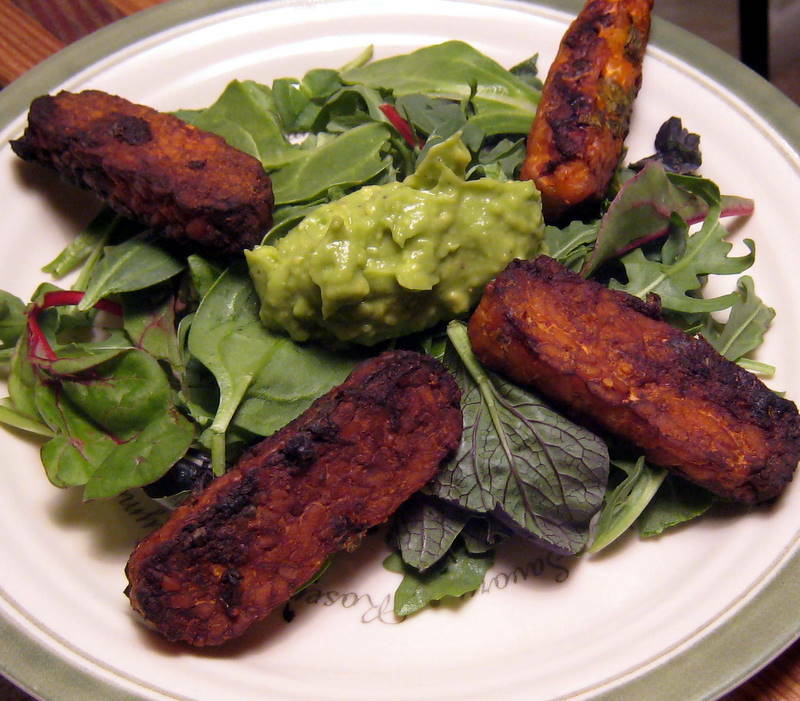 We adapted this recipe from Vegan Cooking School for the tempeh marinade and the carraway makes all the difference. SHAMWOW. Heat oil in a dutch oven and saute tempeh and garlic about 2 minutes. Combine remaining ingredients in a small bowl and stir well. Add sauce and coat tempeh, bring sauce to a boil. Reduce heat and simmer about 30 minutes. Stir occasionally to prevent sticking. The tempeh should absorb most of the sauce. 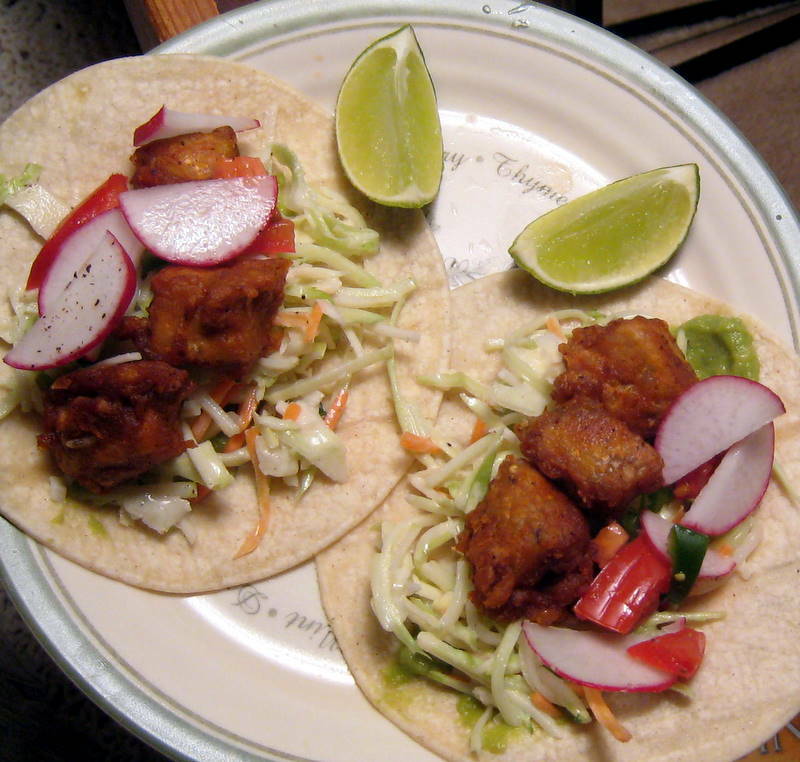 We’re celebrating with our tempeh “fish” tacos. Topped with slaw, guacamole, radishes, tomatoes, jalapenos, and some fresh lime juice. Cut tempeh into small strips. 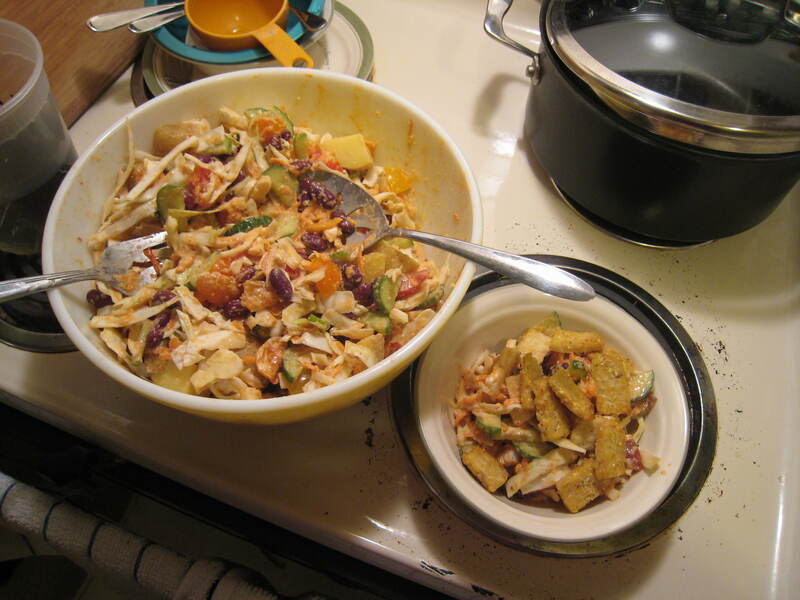 Combine all ingredients in a bowl until tempeh is well coated. Heat oil in a frying pan and cook tempeh until it’s brown and crisp on all sides. Drain on paper towels. Blend together cilantro, mayo, yogurt, lime juice, and vinegar. 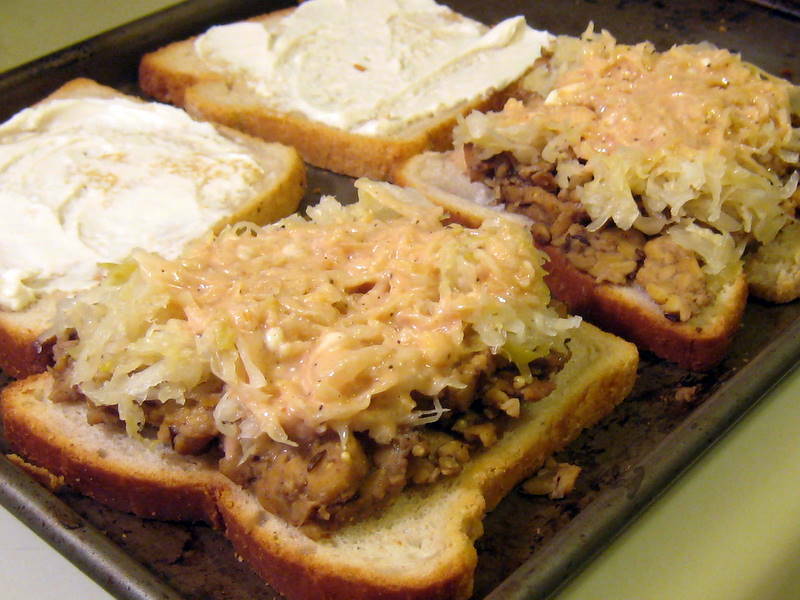 Toss with cabbage, onion, and black pepper. Chill at least 30 minutes. 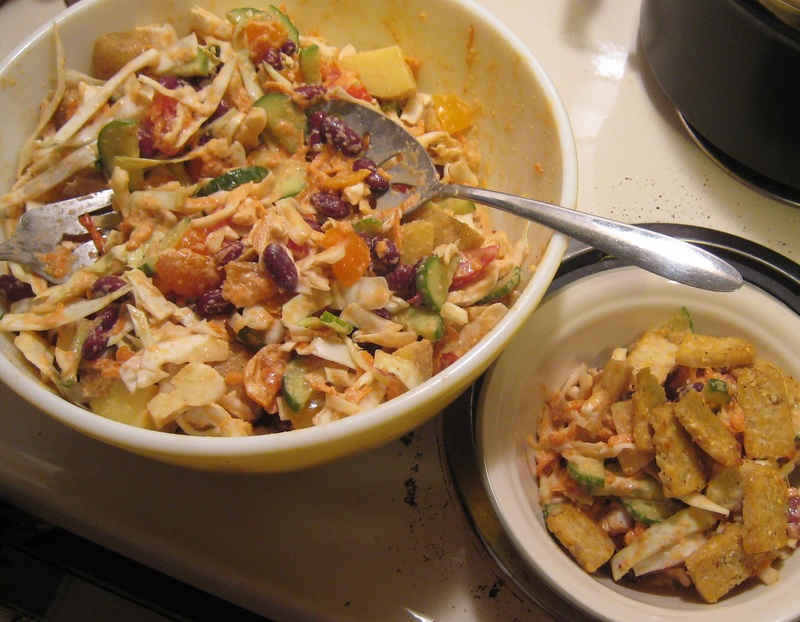 Or if you are in a hurry, microwave the cabbage a little first until it begins to soften, then toss with the dressing. Voila! 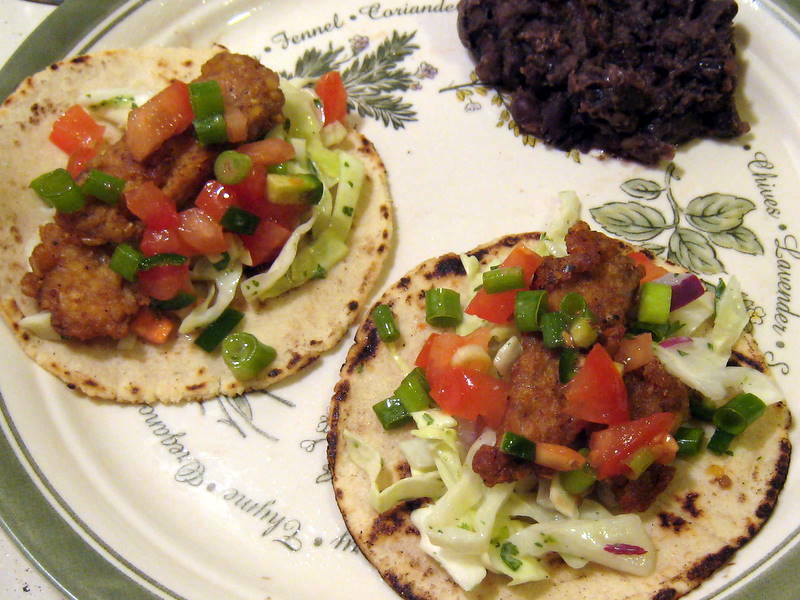 Additional items: fresh tortillas, refried black beans, diced tomatoes and jalapenos, guacamole. You can’t see all the goodies inside, so let me explain the mechanics of this sandwich. Slice open your pitas and add a generous dose of German or dijon mustard. Then fill with some pickled cabbage (or sauerkraut if you planned ahead) and homemade vegan thousand island dressing (ketchup, chohula hot sauce, vegan mayo, dill pickle, soy sauce, minced onions, lemon juice, black pepper). Add a layer of sauteed onions and mushrooms (do not add salt), and finally a layer of soy marinated tempeh (sauteed with some balsamic vinegar until it’s a good chewy texture). Bake sandwiches in a 400 degree oven about 10 minutes.